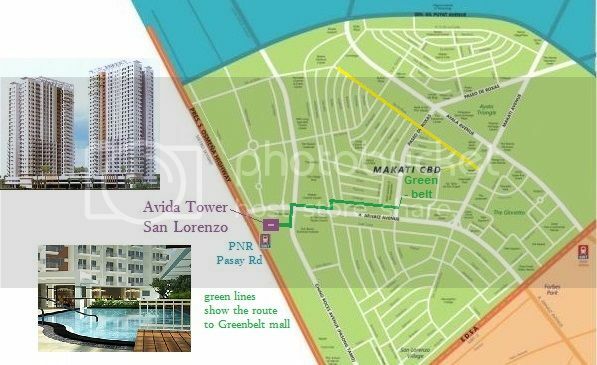 This this is to look at various accommodation options in the area of Makati, and BGC. Please let us know, if you hear of other good websites. to steer people towards renting properties they have built. 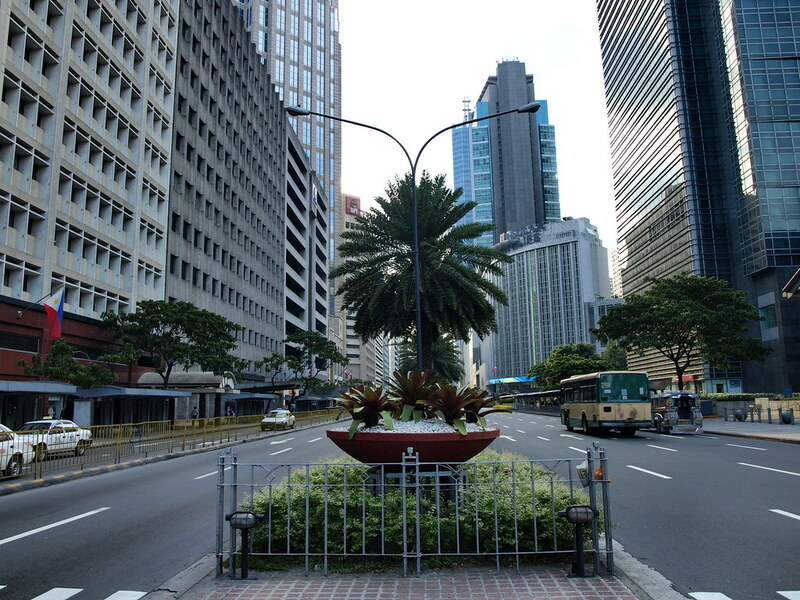 Makati is the main CBD of Metro Manila and the Philippines with most headquarters of Top corporations. As well as 6 five star-hotels, close to 3,000 dining establishments, the hottest nightspots and the country's top shopping malls are located. 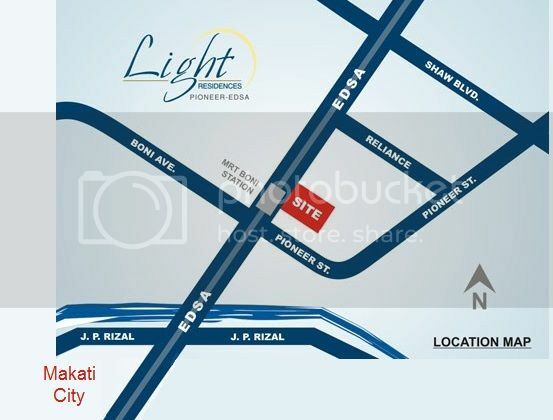 While residents get full access to the exhilarating makati lifestyle, schools, churches, banks, embassies and the Metro Rail Transit (MRT) station are just a few minutes away. 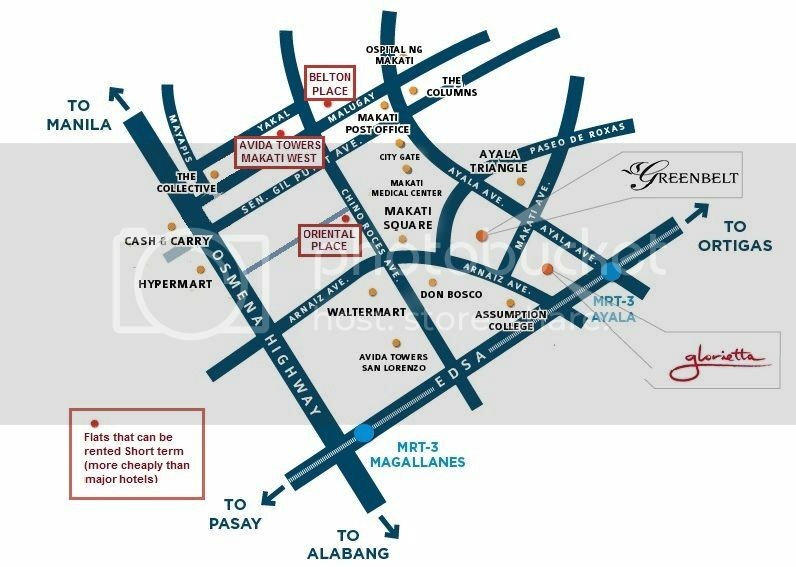 Alternatives to HOTELS, when staying in Makati... Like AirBNB, VRBO etc. Traveling to the Philippines? Maybe you would like to try renting directly from a landlord. price significantly below the cost of a Hotel room. Minimum of 2 days, discounts may be available for stays of 7 days and longer. please feel free to post them on this thread. VBB is a person whose rooms I have rented for periods of a few days to a week. Some friends have also rented from him, based on my suggestion. We all found his rooms to be comfortable and clean, exactly as shown in his Photos. He was very responsive to client requests, and answered many questions cheerfully. 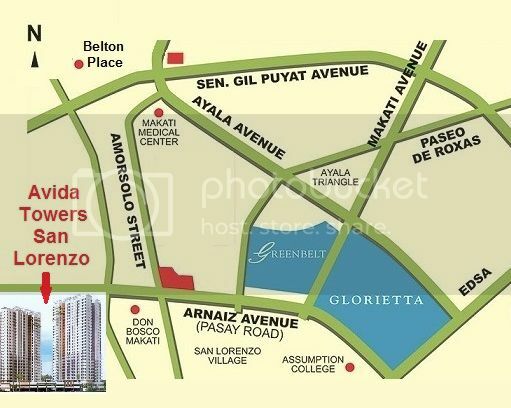 He has three properties that he manages in: Belton Place, Avida West Makati, and Oriental Place. The locations can be found on the map, above. I have stayed in two of these. Maybe you should try this mode of accommodation on a future visit to Makati and Manila. Let us know how it goes for you, and what other accommodation opportunities you discover. If you are staying over 1-2 weeks, you might try this. Many hotels will rent Rooms for one month or longer at discounted rates. Usually, at between 10-14 Times the Daily rate. You might try negotiating around these levels, and see what happens. 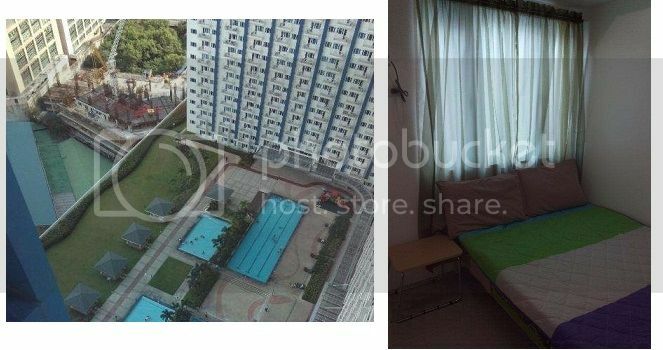 Want to rent a brand New flat - in the Makati area? There's a new flat being completed and turned over to its owner within the next few weeks. This one is in Tower 2, and it is on a high floor facing the amenities. so trade-offs can be discussed with a potential tenant. Then, please send me a Personal Message, via this website. To register, you may need to know that the Favorite B--- is : "admiral byrd"
and Furnished units, were perhaps 10-13% higher. This suggests that Columns is about 20% per SM above Belton Place. 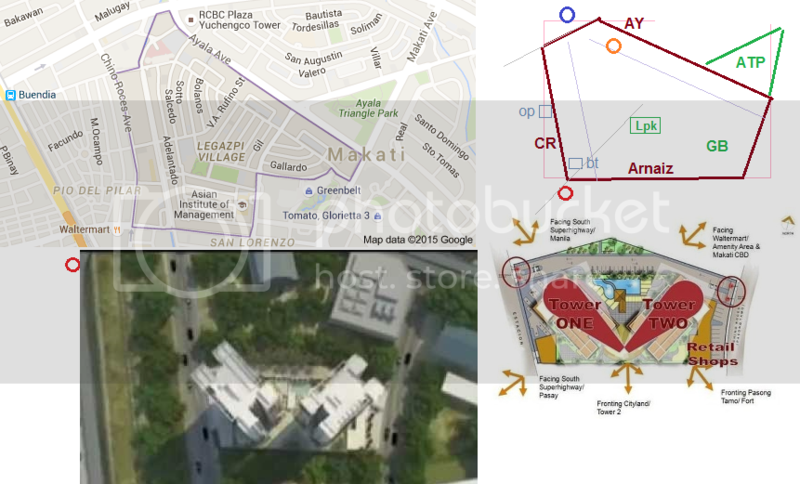 Different Ends of Makati : "the North / South divide"
Will we see a rise of Rents in the North, over years to come... as CityGate gets built? 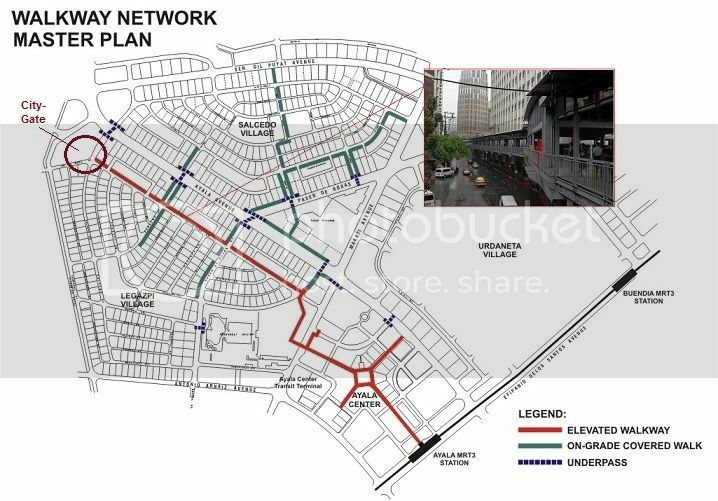 : An answer to those who want more parking for Makati? "Better yet, we need more efficient public transport and less traffic. We can only build so much parking spaces"
Hmmnn..pretty interesting. I never thought that rent in the Columns Ayala Ave is that low. I always thought that it would get at least the same amount of rent as Legaspi Vill or Salcedo Vill since it is in the Makati CBD. 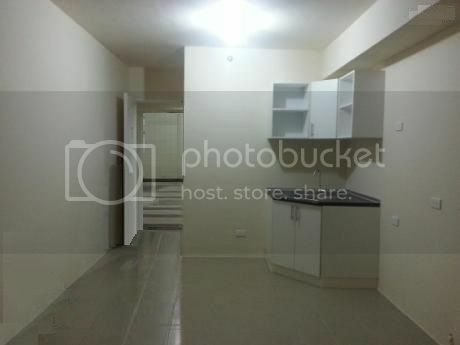 If I post that I am renting my studio unit in Legaspi Village for Php 15K a month, my phone will be ringing off the hook. Note, my unit is in a building built 10 years ago and is "non-Ayala". I am renting it for 25K. It is furnished, but furnishing a unit shouldn't be that expensive. 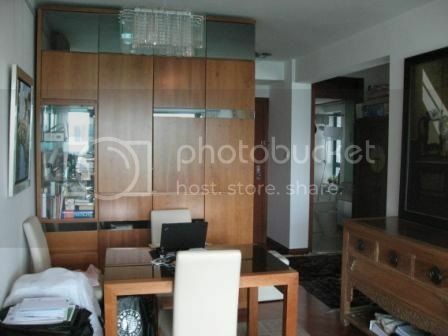 Having it interior decorated is expensive pero when you're renting it out, it does not have to be pimped out. THE TRANSPORT was not good. But the covered walkway has now been extended to Eaton Tower, and Kroma, which is now under-construction. A jump from 25k to 37.5k over 4 years, would be just over 10% per annum, compounded. Residential Vacancy levels continued to improve in the major CBDs as only three new condominium buildings were completed. Overall vacancies in Makati CBD improved further to 7.6%. 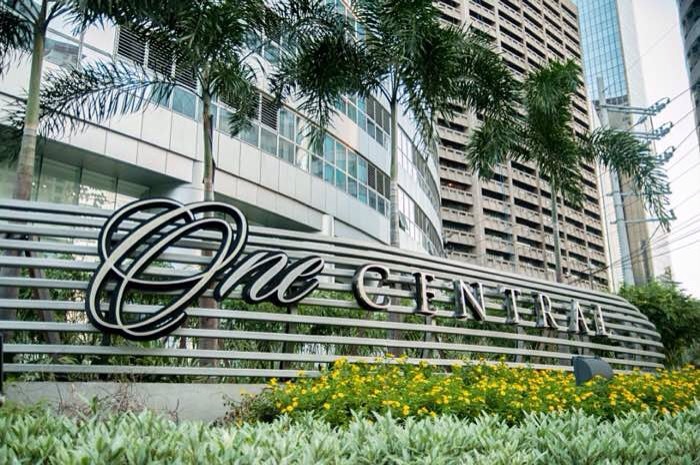 Rental growth in Fort Bonifacio was the fastest during the second quarter, after increasing by 1.9% and rising to Php871 per sq m; however Rockwell Center maintained its status having the highest condominium lease rates. With 5,500 new units set to be delivered in the second half of 2015, landlords must brace for a more competitive environment. 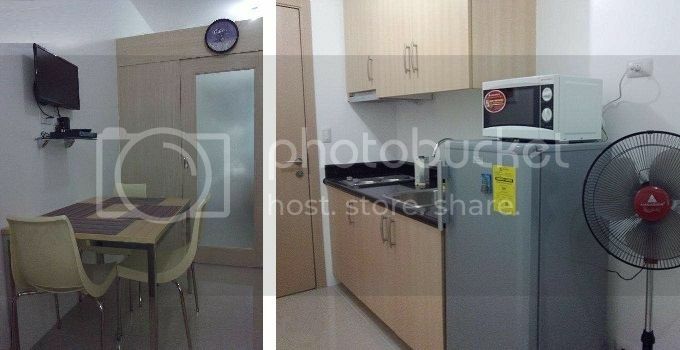 In HK there's a company called Dash, that will "turn your rental apartment into a serviced flat". They manage around 200 units of One Central building. 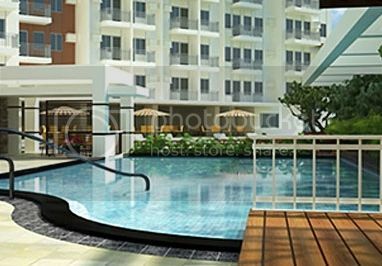 Versailles Stay, the new and revolutionary concept in property management is now in the country. Property business is one of the sunshine industries in terms of investments; Versailles Stay is here to take advantage of it. Capitarise Holdings Inc. and FPD Asia launched Versailles Stay last May 29, 2015 at their pioneering branch in One Central Residences, located on Gil Puyat Avenue near corner Ayala Avenue in Makati City. Versailles Stay is a high-quality, fully furnished residence offering rental management solutions to unit owners and developers while guests and clients have their own share of experience for superior hospitable lodgings, convenience and value-for-money. The Versailles Stay management group takes care of furnishes and maintenance of these units so that they will be always-ready and available for stay-cations and travelers. There’s a new property business concept that is set to change the face of rental property in the Philippines by Capitarise Holdings Inc. – Versailles Stay. Versailles Stay is a rental management solution for fully furnished, high-quality residences offering dependable property care for unit owners and developers, value for money, convenient and hospitable lodging for guests and clients. You might ask if this is another high end hotel. No. 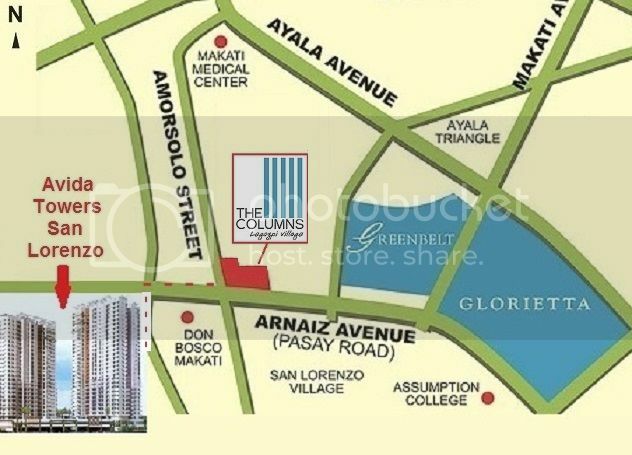 This establishment acts as a bridge for foreign property investors and enabling them to access apartment suites from high-end condominium developers across the Metro. Versailles Stay is not tied to any structure. Their innovative system can be easily set-up in any high-end residence building with One Central being their first venture. Versailles Stay has stylish, luxurious and comfortable units from Standard, Deluxe and Premiere Suites offering flexible and affordable rates allowing you to save up to 50% compared to equivalent standard hotel rooms.Each suite is equipped with an air conditioning unit, cable TV, private toilet and bath with hot and cold shower, safety deposit box, mini bar, espresso machine, kitchen with refrigerator and microwave oven. Linens, pillows and basic toiletries are also provided. In addition, all suites are wifi equipped. Daily breakfast for 2 by Manila Catering is also included and served in the comforts of your own unit. 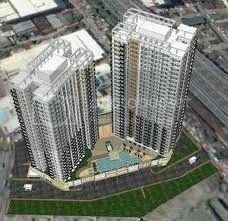 Versailles Stay currently manages 200 units at One Central, fifty (50) of which are available for short term stay. I spoke with them at some length when I was last in Makati. + In return for maintaining the property, and finding tenants, VS take a big share of revenues - was it 50%? This deal only makes sense for someone who thinks they cannot find a tenant on their own, and are worried that their (empty?) property will not be looked after. AIRBNB COUPON: Get $20 off your first Airbnb stay. This article is Part 1 of The Airbnb Series. When you’re done, check out Part 2, Part 3, and Part 4. You see, I recently finished renovating one of my apartment units. Pre-renovation, it rented for $700 per month. Post-renovation, I think I can rent it for about $1,100/month. And that’s how The AirBnb Experiment began. As soon as “I wonder if …” popped into my mind, my knee-jerk reaction was to focus on the drawbacks of managing a vacation rental business. #1: Separate “Investor Paula” from “Manager Paula.” I’ll track my hours and ‘pay myself’ the free-market rate for this position ($20/hr). Then I’ll see whether or not Investor Paula still makes a profit, even after paying Manager Paula for her time. This is crucial. Many business owners think they own an investment, when they really just own a job. The only way to successfully invest in real estate is to make a profit after paying yourself (or paying someone else). #2: Commit. I’ll commit to this experiment for at least 6 months, if not a year. That way, I can measure vacancy and turnover across the span of several seasons. Ryan Scott says traditional landlords are missing out. The real money is in Airbnb Inc.
Scott, 33, figures he brings in half a million dollars a year in revenue from 14 San Diego homes he leases by the night using the short-term rental site. That’s a 20 percent profit margin and almost twice the revenue he could get from year-round tenants, he said. Scott owns eight of the houses and manages six others for landlords, and he’s able to do it and still keep his day job. Listings by investor hosts such as Scott, powered by sites like Airbnb, Vacasa and HomeAway Inc., are surging in urban hot spots around the U.S. The rise of full-time hosts is spawning a crop of startups offering support services from housecleaning to key exchange. While the unlicensed lodgings are giving a lift to local restaurants, shops and bars, they’re drawing scrutiny from city governments and driving some neighbors crazy. Tracy Smith lives two houses down from one of Martin’s rentals, a short walk to the popular Rainey Street restaurants and bars. She says she’d rather see kids in the backyard of Martin’s property than guys playing beer pong, she said. Angry neighbors haven’t slowed the expanding universe of the more than dozen startups that have emerged to serve the alternative travel industry, said Jeremiah Owyang, an industry analyst at Crowd Cos., a Redwood City, California-based research firm. Companies include Beyond Pricing, which offers software so that owners can vary rates based on supply and demand; Guestprep.com, a turndown service for hosts that replaces towels and sheets and reports back on the state of the property; Airspruce, which links hosts with professional travel writers to pen listing descriptions; and Keycafe, which allows guests to pick up keys from neighborhood cafes. and use it as my pad when I visit here. Yes I suppose if you intend on staying there as per your calculation for 90 days a year you probably are better off in your own place instead of hotels etc. Infact, I would think that also adds the flexibility of selling at anytime with no tenant in there. Of course airbnb is an option too, if there is someone you trust to manage it whilst away. (A consideration could be to becomes a specialist airbnb operation on several units on behalf of owners. The advantage to potential guests could be the fact that you're a foreigner and perhaps can better address their needs in Phil)? He has some heavier family responsibilities coming, and will not be able to be "Johnny on the Spot" sorting out check-ins, cleaning, and unexpected emergencies. He tells me that if you properly price in the costs and risks of having others do this, long term leasing may be just as financially rewarding. Essentially, being an airBNB Landlord can be demanding and time consuming. If you want the job duties it generates, fine. If you have someone else do it, there are trust issues. If Mr B--- makes this decision, and doesnt find it easy to find someone he can trust, how can I? + Online classified ads sites. Forums. Don’t underestimate the power of word of mouth, and if you are able to maintain a good relationship with forum moderators, take the opportunity to advertise your property on the forum when possible. Be careful not to step out of netiquette lines when using this method, as spam posting is usually dealt with severely. When using forums to advertise, look for an existing thread on real estate trade first before posting a new topic. This way, you can already scour for potential buyers who have already replied in the threads before even posting your ad. Just like in a classified ads website, it’s important not to forget to provide the necessary information in your profile so as to look credible and easy to reach. Yields in Manila remain good, but somewhat lower than during the past few years (when they were excellent). Transaction taxes (known as ‘capital gains taxes', but not actually such), and (if observed) official income tax rates applicable to non-resident investors, are high. 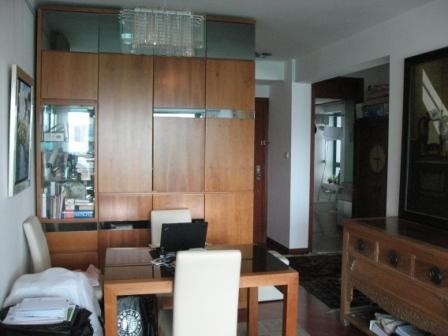 Buying prices for condominiums are at around US$2,800 to US$3,200, (/44 = P 64k - p 73k psm - old prices !) considerably up on previous years. Unusually, yields are not highest on the very smallest units, which suggests that smaller condominiums are oversupplied. The highest-yielding units are 80 square metre units (which have gross rental yields of around 7.7%). Last year we found that yields were surprisingly good on very large condominiums (250 square metres), at around 9%, but this year we were not able to assemble a database of this dimension. This may be an optimal size for investment. P 64k psm x 8% = 426 psm per mo. I live in Philippines and there is a misunderstanding here about this rule. Many people think you just lose your condo once it reached 50 years old. I have an unit in a 20-something years old building and several people here told me that I will lose it after 20-something more years years, which is not true. What usually happen is a developer makes an offer on a well located old building to build a new one instead. Sometimes they offer a new unit in the new building constructed, sometimes money only, sometimes both. If majority of the owners of the old building (more than 50 years) agreed then the others are forced to join the deal. So this is not really a concern when you buy a condo. If such offer is made to you by a developer once your building is 50 years old it will probably be an attractive offer or the majority of owners just won't accept it and your building will remain as it is. Thanks again for this article. I'm going to forward it to some of my friends and family who misunderstood this rule. his also decreases vacancy, which is costly for a rental business. 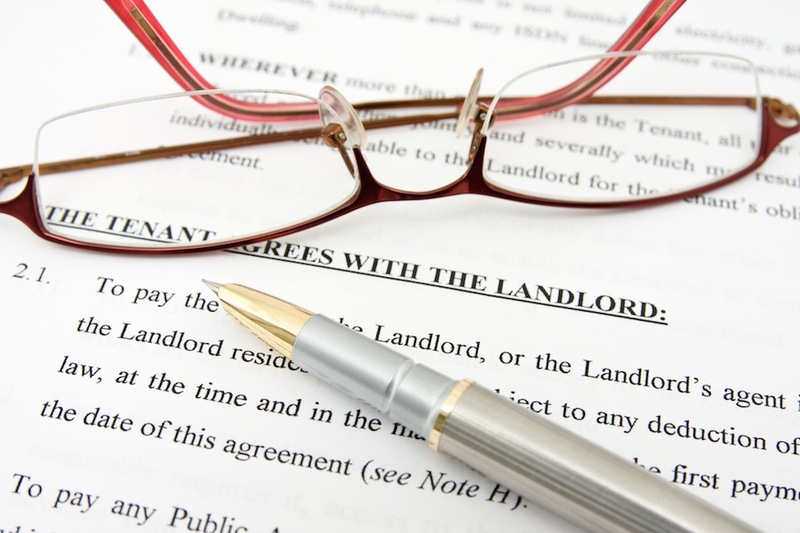 Drafting a very detailed lease contract is very important, as it will save you headache later on. Make sure that it clearly states the terms on advance payments and deposits, when rents are expected to be paid, number of occupiers, and your policies regarding how the leased property can or cannot be used or occupied. This means detailing your policies regarding subletting, the presence of pets, and which alterations or improvements can be done on the property. When all are clearly detailed in the lease contract, the lessees cannot feign ignorance of the rules should issues arise. One of the burdens of being a property owner is that you have to pay your annual real property tax. Failure to do so will incur a 2 percent penalty per month on the amount unpaid until it is fully paid. However, some localities (Parañaque, for instance) offer discounts for those who pay early. This can potentially save the property owner thousands of pesos, which he can add to his profit. Renters (single people and young couples?) will walk those extra steps to Avida Towers San Lo to save money by renting cheaper flats. On Studios, they are paying a rental rate which is 25% cheaper per SM as at Col-Legs - that is roughly the PRICE differential for buying the flats in the secondary market. When it comes to 1 BR flats the flats have a bigger savings per SM, offering a greater savings to get people to take those extra steps. Renters save 50% on 1 BR flats and 34% per Sq Meter. The savings is even more apparent for 2BR flats, which are less than half-price and 36% cheaper per SM than 2BR flats at Col-Legs. This suggests that potential renters for larger flats will not take those extra steps (with their children?) unless there is a very substantial savings for doing it. I think this difference has to do with families with small children. There seem to be very few babies and few very young children living at SanLo. The families that can afford it would prefer to pay a bit more each month for their flats at Col-Legs, and have an easier walk to the attractions of the shops and restaurants at Greenbelt. 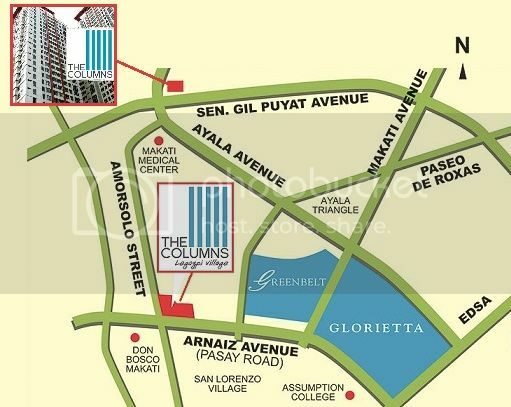 Many more expats rent at Columns Legaspi too, from what I have seen. An average condo located within 100 meters of an MRT station is at least Php16,645 more expensive per square meter than a similar, newly built condo situated more than 500 meters away. Can BPO workers afford condos?